We’d pre-purchased a Viator half-day city tour for the next morning. The meeting location was very convenient, just around the corner from the main train station. We took the tram to the train station and walked the couple of blocks from there. We’d hoped to find a place to eat breakfast in the train station but didn’t find anything to strike our fancy. There are a couple of small kiosks there that sell tours and we went to the one that indicated they were a Viator supplier. But it turned out that it was the other kiosk offering our particular tour. With tickets in hand we went across the street to Starbucks for breakfast. Starbucks is usually kind of wasted on the two of us as neither of us are coffee drinkers but we found museli, fruit and hot chocolate, plenty to start the day off right. Our tour actually started off at the park beside Lake Zurich and it was just as beautiful as it had been the day before. We were really very fortunate with the weather on this trip! Our motorcoach then dropped us off at the Dolderbahn, a rack railway that runs up the side of the Adlisberg mountain. (If you’re familiar with the Incline Railway in Chattanooga, TN, it’s similar, though not nearly as steep.) Once atop the mountain we had lovely views of the region including both the lake and the city. The Dolder Grand Hotel is atop the mountain and there’s a large park/recreation area up there as well, though we didn’t spend time at either place. While we’d been riding up on the Dolderbahn, our motorcoach had been wending its way up the mountain so we were able to ride it back down. Kudos to the driver because some of those roads were very narrow and lined with parked cars! 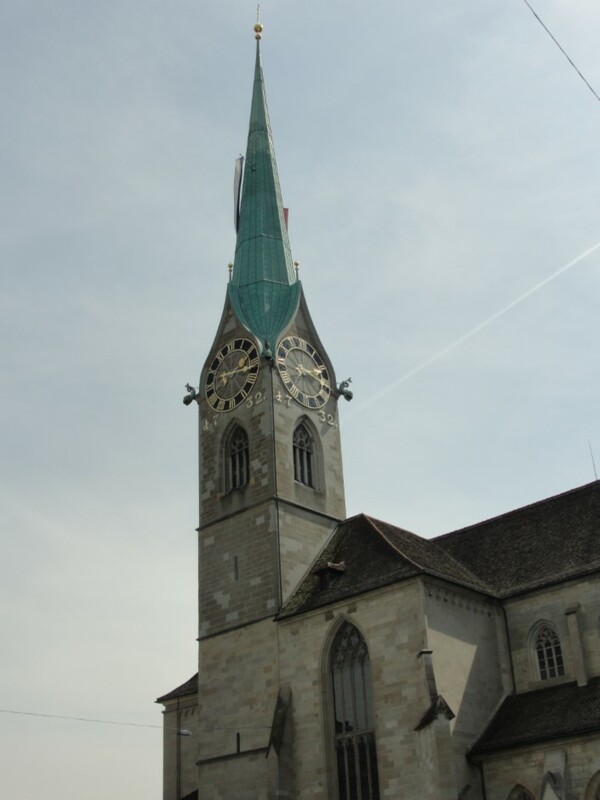 Back in town we stopped at Fraumünster, one of the three main churches of Zurich, which is known for its five large stained glass windows designed by the artist Marc Chagall. They were just lovely but unfortunately no photos are allowed. That was the end of our tour and we were left to explore Aldstadt (Old Town) on our own. One thing our tour guide had mentioned was that each spring there is a holiday that celebrates the end of winter. Called Sechseläuten, it’s usually held on the third Monday of April but apparently was a week later this year. The high point of the holiday is the burning of Winter in effigy in the form of Böögg, a snowman figure filled with explosives. 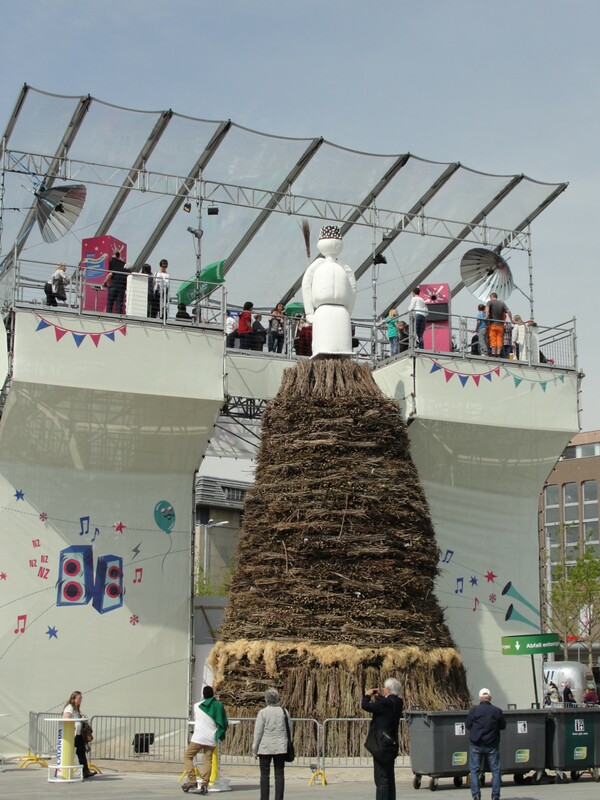 In preparation for the festival a large pyre had been built and we could see the back of the Böögg figure. There were lots of folks willing to pay the charge and climb up to see him up close however! It had been a tough winter in many regions and apparently the good folks of Zurich were ready for it to be over. We spent the afternoon and evening wandering through Aldstadt and collecting a couple of souvenirs. We ended up dining at Ristorante Toscano, a small Italian place. The meal was excellent and it felt more like a locals place than a tourist place though they spoke English very well. It’s worth noting that everywhere we went in Zurich we had no problems with people not speaking English. Although my friend’s parents are from Germany and so she does speak and understand some German, it was nice that it wasn’t a struggle. We were quite full from dinner and decided to walk back to the hotel to get in a little exercise since we knew we’d be sitting for hours during the flights home the next day. By the time we reached the Park Hyatt we were ready for dessert so we stopped in at the cafe there. As we perused the menu we didn’t see our favorite but found other options that would suit us. As the waiter answered our questions about one of the menu items he described something that sounded supiciously familiar. With a bit of clarification we realized one of items we’d overlooked was, in fact, chocolate melting cake! It was the perfect end to the trip.